SCID (pronounced "sid"), Telespector's self-contained inspection device is the practical choice for contractors or municipalities that required an economical yet full-featured pipeline inspection system. SCID's frame is fabricated from heavy gauge, epoxy coated steels with a palletized base that allows a forklift truck to easily load it into a van, trailer or pick-up truck. Eyehooks are available for lifting with an overhead crane. 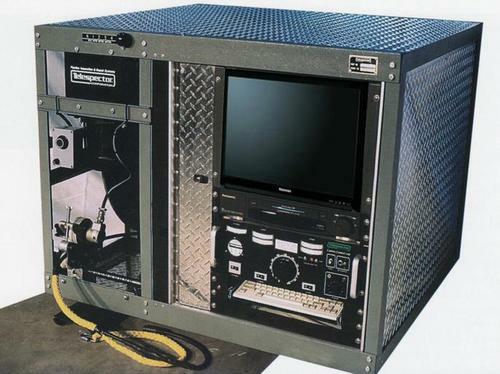 Within SCID's compact frame is a full-size video cable reel, video console, two locking storage compartments and enough space to store a 3000 watt BLANK type gasoline generator. The video cable reel holds up to 1,000 feet (300m) of multi-conductor cable (0.60" - 15mm O.D.) and includes a maintenance-free slip ring, an electric rewind unit and a multi-ratio transmission and an automatic level wind assembly with an electronic distance encoder. The fully-equipped video console includes a 19" high resolution LCD color monitor with a special flare-free coating that enhances viewing in high ambient light conditions, a full function VHS VCR camera control unit and a Data Display Unit which displays important information like distance, job location, date/time and more to the video monitor and VCR. SCID is available with several camera options including: self-propeller tractor camera, pan and tilt camera or a skid type camera. A 3000 watt, low-decibel BLANK type gasoline generator is included as standard equipment. A 4GM battery-powered system is availblbe as an option. To protect SCID from the elements, a heavy gauge waterproof fabric cover with zippered corners is included.